Abandoned, painfully thin, and infested with ticks and worms, Buffalo Bill was found close to death in the middle of the elephant territory next to a rarely used track in Maun, Botswana. Tales of stray or abandoned dogs found curled up on the streets and in dire need of help isn’t unusual. Maun is the fifth largest town in Botswana. It's renowned for being the main gateway to the Okavango Delta, one of Africa’s most wildlife-rich areas. As Botswana’s tourism capital, the city entertains more than 35,000 travellers with luxurious and intimate safari experiences every year. But the city streets act as a refuge to an estimated 40,000 semi-domestic dogs who roam freely across the landscape. Whether it’s the “cat island” in Japan or the “land of the strays” in Costa Rica, the media often portray feral colonies as utopian destinations. However, in Botswana, a country where over 30 per cent of the population lives below the poverty line, access to basic affordable veterinary care is limited, particularly for those living outside of major urban settlements. Little or no veterinary care can lead to the spread of infectious diseases, including rabies, distemper, and leptospirosis. 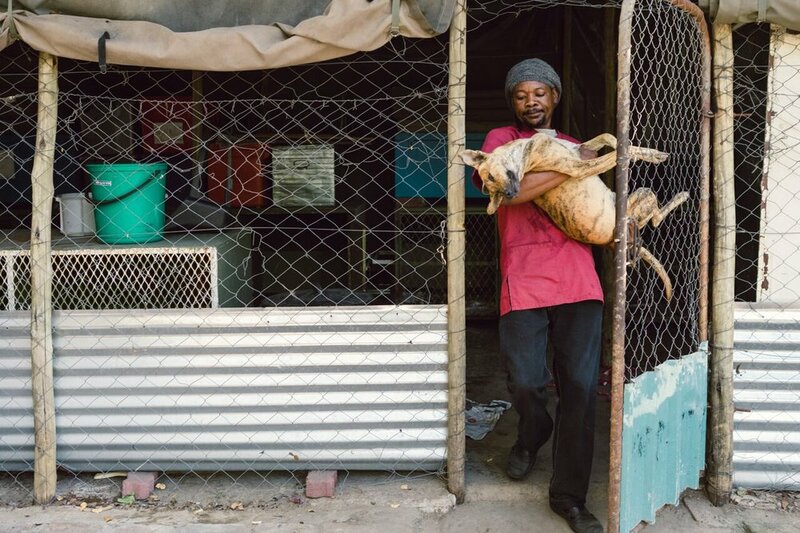 The fringes of the inland delta is home to the Maun Animal Welfare Society (MAWS), a grassroots animal welfare charity that was founded as The Dog Project by Mervyn Palmer. The organization is dedicated to preventing indiscriminate breeding, transmissible disease and human-inflicted cruelty of domestic animals, and to help improve the welfare of domestic animals across Botswana. Focused on controlling the rampant canine population, MAWS runs a local clinic and regularly dispatches veterinary teams to remote areas, offering free or subsidized veterinary treatment. According to Lamb, the organization has sterilized and vaccinated more than =17,000 dogs since we the program started in 1998.
in 2017 Margaux Yiu, a portrait photographer based in Toronto, travelled to Maun to document the work MAWS is doing to improve the lives and health of domestic animals. During her time with MAWS, she spoke to locals on how the charity has inspired real change in the community. She spoke with one woman who remembered seeing dogs and donkeys dying on the side of the road, not knowing what to do or how to deal with the situation. "I think the benefit to the community, and the difference it has made to everyone (including the animals) is tremendous. People appreciate MAWS and all of the work they’ve done, recognizing that MAWS disappearing would be a regression into the past. Everyone seemed to be aware of the benefit of MAWS to the community and their animals,” said Yiu. Recognizing the importance of community engagement, MAWS also promotes educational initiatives to encourage locals to become more involved in caring for their domestic animals. Over the past decade, MAWS has developed strong relationships with village chiefs to ensure outreach clinics are welcomed and facilitated by the villagers. Awareness is the vital first step in enabling change, but it is also one of the biggest obstacles facing MAWS. “I’d say the greatest challenge we probably face is awareness. It’s our mission to humanely manage domestic dog populations to protect wildlife. We believe that if we were able to raise awareness of this issue, other obstacles would more easily be overcome,” Lamb said. Despite the efforts of MAWS, substantial government policy needs to be implemented for further social change. Botswana’s animal cruelty legislation is not keeping up with the rest of the world. In fact, Botswana’s animal cruelty laws have not been updated since 1966. For animal lovers, even one dog's suffering is one too many. Through sterilization, vaccination, and education, MAWS continues to play an instrumental role in heralding a better future to thousands of animals in Botswana. Click here to learn more about the Maun Animal Welfare Society and how you can help.